Flower arranging from your garden reduces the cost of flowers especially if you are a designer or if you love having flowers/foliage in your home most days. Here is a workshop sneak peek before I begin flower arranging today. 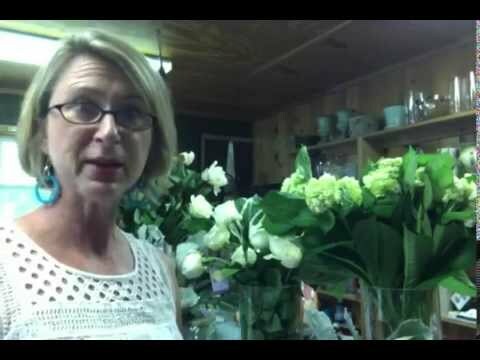 All of the flowers and foliage shown in the video were purchased at a local wholesale floral distributor which means they sell flowers that have traveled either from somewhere in the USA or somewhere else in the world. I would like to show you how to get the same look as these without having to pay a big ticket AND without having to travel much further than your own yard making flower arranging much easier!! « Kitchen Reno takes to the Water!